The number of Spanish home sales inscribed in the Land Registry rose by five percent in May compared to the same month last year, show the latest figures from the National Institute of Statistics (INE). However, sales plunged 27% in the Balearics, and continued to fall in Catalonia, where the political situation is undermining investor confidence. 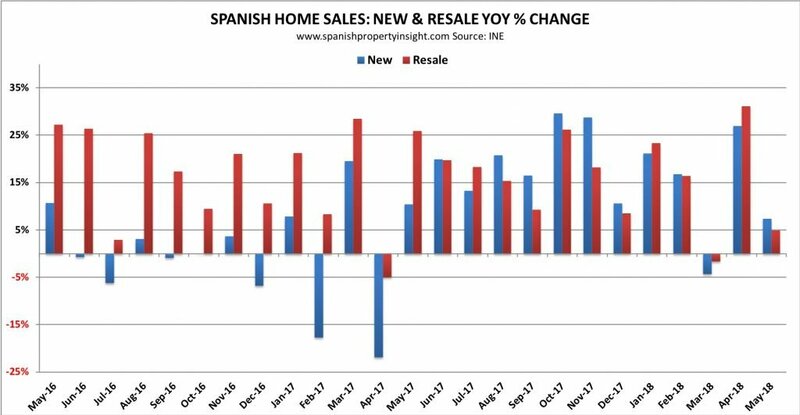 There were 42,708 Spanish home sales inscribed in the Land Register in May, and 47,177 if you include subsidised homes (known as VPO) all according to the latest figures from the INE, based on source data from the Spanish Land Registrars’ Association. These were sales recorded in the Register, not sales that took place in the month. For actual sales in May the figures from the Spanish Notaries’ Association are more timely, and show sales rising 7.7% to 51,896 including VPO. 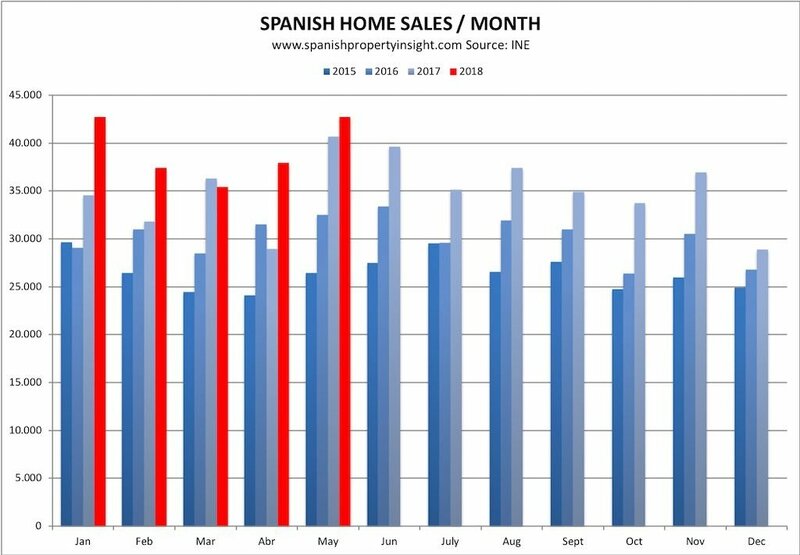 Both sources show the Spanish property market continuing to expand. New home sales inscribed in May were up 7% to 8,303, and resales up 5% to 38,874, according to the INE. Off-plan sales are not recorded in these figures, but are now taking up a significant percentage of demand, and I expect would show new homes sales growing much faster were they included. 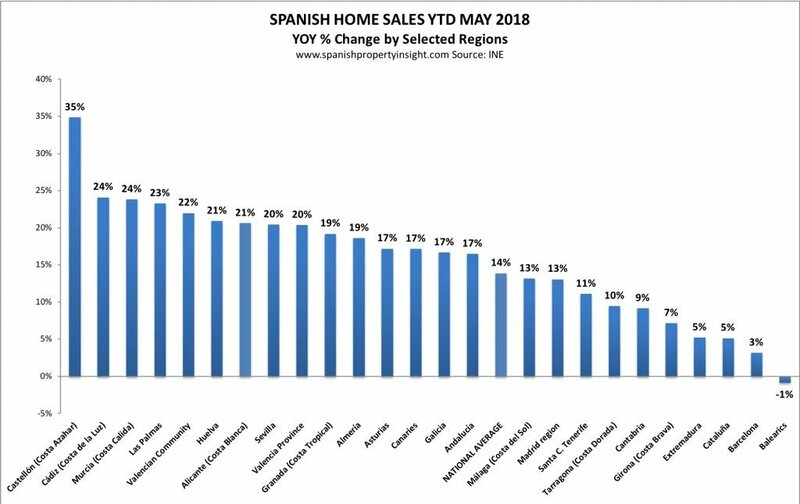 Year-to-date (first five months), the market has expanded by double-digits in almost every region compared to the same period last year, with the notable exceptions of the Balearics (-1%), Catalonia (+3%). Looking just at May (next chart), there was a surprising divergence in results between popular tourist destinations, with sales up 18% in Alicante, home to the Costa Blanca – a perennial favourite with foreign investors – but down 27% in the Balearics, also another magnet for foreign buyers. The chart shows the change in sales in a selection of regions and provinces. 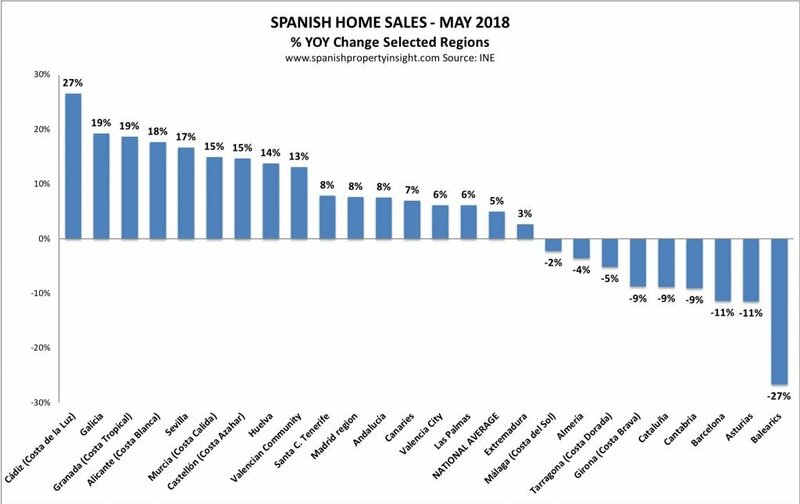 Four of the nine regions / provinces where sales declined were in Catalonia, where a local political problem has undermined foreign buyer confidence, and which partly explains why the market has contracted in those areas. The politics has stabilised a bit, and I suspect this will bring back some foreign buyers to Catalonia, though many have been lost for good. But what’s going on in the Balearics, which has been one of the hottest markets since the recovery started? 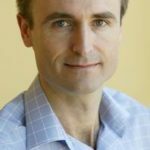 I’ll tackle this question in a separate article next week, as I’m waiting for feedback from property professionals on the ground in the Balearics with their thoughts on the reasons behind this sudden decline. If there are any property professionals in the Balearics amongst my readers I’d love to hear from you, either by email or in the comments below.